Above: A Universal Pictures publicity still of Johnny Mack Brown, circa 1937. John Mack Brown was one of the most convincing and likable movie cowboys. His genial smile and soft, drawling Alabama accent aided him in establishing an air of friendliness and courtesy, and his determined frown and husky frame assured audiences that he could handle any nasty situations that might arise. His persona was that of a good-natured, easygoing cowboy “just doin’ his job,” and according to his co-workers, this persona tallied pretty closely with his off-screen character. Brown’s pleasant personality served him well during his long career as a B-western hero–a career that was brought about through his stardom in a series of Western serials. Johnny Mack was born in Dothan, Alabama, and attended the state university. While at college he became a star running back, and is still well-known in football circles for the touchdowns that won the 1926 Rose Bowl for the University of Alabama. Upon graduation in 1926 he declined several offers from professional football teams and went into acting instead; his good looks and football fame ensured his almost immediate signing by Metro-Goldwyn-Mayer. Since Brown’s thick Southern drawl was not a problem in silent films, MGM principally cast him in sophisticated society dramas (such as Divine Woman and Our Dancing Daughters), in which he played the male lead opposite glamor queens like Joan Crawford, Norma Shearer, and Greta Garbo. During this time, he also played his first Western starring role–the title part in one of MGM’s early sound pictures, King Vidor’s Billy the Kid (1930). With the coming of sound, Brown’s accent caused him to lose out on the drawing-room drama roles that had been his property up to now, and MGM dropped him once his contract ran out in the early 1930s. Nat Levine, boss of the shoestring studio Mascot Pictures, made a regular practice of scooping up stars who were down on their luck due to finances, bad career decisions, or maltreatment by major studios. By starring such players in his studio’s serials, Levine could attract movie fans who still recalled the actors’ earlier feature work; John Mack Brown, ex-MGM star, was a prime prospect from Levine’s point of view. The shrewd producer, probably recalling Brown’s previous Western turn in Billy the Kid, signed him to play the title character in the twelve-chapter serial Fighting with Kit Carson (1933). Brown’s Carson spent most of the serial trying to clear himself of stealing the army’s gold, pursuing the secret leader of the “Mystery Riders” responsible for the thefts (Noah Beery Sr.). Kit Carson was an energetic and entertaining serial, with lots of well-filmed outdoor action that compensated for Mascot’s typically small budget. Brown, used to the deliberately-paced film-making methods of MGM, must have been rather disoriented by Mascot’s frenetic shooting schedules, which typically began before dawn and lasted till after dark–a disorientation that sometimes seemed to be reflected on screen by Brown’s occasionally stiff manner. For most of the serial, however, he was assured, cheerful, and determined, delivering a performance that would prove the start of a second film career for him. Above: John Mack Brown delivers a report to off-camera Army officers in Fighting With Kit Carson (Mascot, 1933). Above: John Mack Brown delivers orders to his team of mountain men, before setting out to transport a gold shipment in Fighting With Kit Carson. Brown’s starring role in Fighting with Kit Carson did not translate to immediate B-picture stardom, however. For the next two years, he played largely supporting parts at studios like Warner Brothers (including that of straight man to Joe E. Brown in Son of a Sailor) until signing with A. W. Hackel’s Supreme Pictures in 1935 for a highly popular series of B-westerns that continued until 1937. The exposure gained through these films, combined with his prior serial experience, caused Universal Pictures to star him in their 1935 serial, The Rustlers of Red Dog. Brown played Jack Wood, an ex-marshal who sought to settle down, but who pinned on his badge one more time to defend a westbound wagon train and the gold-rich town of Nugget from marauding Indians and the titular rustlers. Rustlers, episodic but more polished that Fighting With Kit Carson, featured well-defined characters and a well-written script. Brown’s relaxed charm worked well in his romantic scenes with leading lady Joyce Compton, while his low-key personality contrasted nicely with his more flamboyant sidekicks–Raymond Hatton as the roguish scout Laramie and Walter Miller as the smooth gambler Deacon. In addition, Brown’s commanding size allowed him to convincingly oppose the husky, snarling Harry Woods, who played the leader of the Red Dog rustlers. The basic setup of Rustlers of Red Dog–Brown battling outlaws and Indians, protecting wagon trains, and cleaning up towns, usually accompanied by colorful sidekicks–gave rise to a basic and reliable formula that Universal would utilize for Johnny Mack’s three subsequent serials. Above: Johnny Mack Brown and Charles French in a still from Rustlers of Red Dog (Universal, 1935). 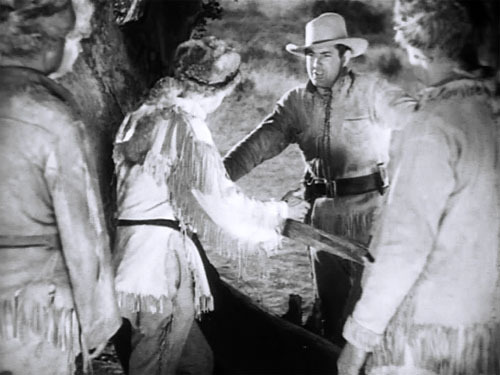 Above: Johnny Mack battles an Indian in another Rustlers of Red Dog still. Brown’s second Universal serial was Wild West Days, which he made in 1937 after finishing his series for Supreme. Days cast Brown as a roving frontiersman called Kentucky Wade, who assisted his friend Larry Munro (Frank McGlynn Jr.) against a band of outlaws called “The Secret Seven,” a gang that controlled all criminal activity in and around the town of Brimstone. The Seven’s leader, seemingly respectable newspaper editor Matt Keeler (Russell Simpson), was out to grab Munro’s ranch after learning it contained valuable platinum deposits. Brown was aided in his fight against the Seven by another enjoyable team of sidekicks: singing cowboy Dude (George Shelley), excitable Mexican Mike Morales (Frank Yaconelli), and crafty Trigger Benson (Bob Kortman, usually a heavy). Wild West Days had the same basic strengths– good writing and good action–as Rustlers of Red Dog, but also possessed a somewhat tighter plot; it was perhaps the best of all Brown’s serials. 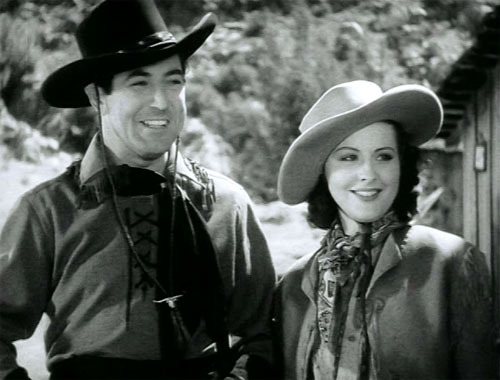 Above: Johnny Mack Brown tries to cheer up leading lady Lynn Gilbert in Wild West Days (Universal, 1937). Above: Frank McGlynn Jr. and Johnny Mack Brown in Wild West Days. Brown’s next serial, Flaming Frontiers (Universal, 1938), found Brown, as “Tex Houston, famous scout,” again trying to keep villains from stealing a mine, in this case a gold mine belong to Tom Grant (John Archer) and his sister Mary (Eleanor Hansen). Charles Stevens, who had also played the principal henchman in Wild West Days, battled it out with Brown again as the double-crossing henchman Breed, and Jack Rutherford made sporadic appearances as Buffalo Bill Cody, helping Tex Houston out of tight places. Flaming Frontiers lacked the colorful sidekicks of Brown’s first two outings, but still had much to recommend it–good acting, enjoyable scripting, varied locations, and two separate gangs of villains, one headed by pompous James Blaine and the other by smooth Charles Middleton. It also had another likable performance by Brown, who was by now thoroughly at home in the serial milieu. Above: John Mack Brown and Eleanor Hansen in Flaming Frontiers (Universal, 1938). 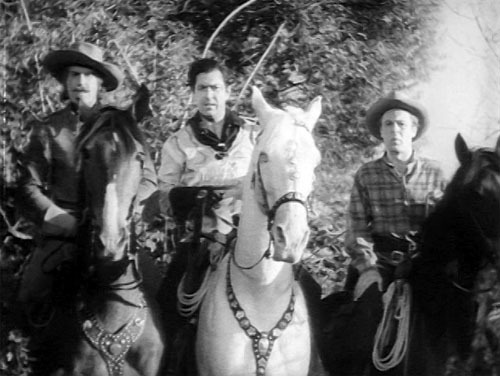 Above, left to right: Jack Rutherford, John Mack Brown, and John Archer in Flaming Frontiers. In his final serial, The Oregon Trail (Universal, 1939) Johnny Mack played Jeff Scott, a frontier scout and US Army agent who, with his tough sidekick Deadwood (Fuzzy Knight) took on the task of guiding a wagon train along the perilous trail of the title. Along the way, Jeff and Deadwood were forced to deal with badmen, Indians, and a crooked wagonmaster (Jack C. Smith). All these menaces were in the pay of evil profiteer Sam Morgan (James Blaine), who was bent on keeping settlers out of the Oregon Territory in order to protect his fur trading empire. but Scott got the settlers through and also got the goods on Morgan in the final chapter. Louise Stanley was the heroine, Roy Barcroft appeared as Colonel Custer, and Charles Stevens had his third shot at defeating Brown (and lost again) as Blaine’s henchman. The Oregon Trail was somewhat slower than Brown’s three earlier serials, and used several portions of stock footage from its predecessors, but still furnished a respectable conclusion to its star’s serial career. Above, from left to right: Johnny Mack Brown, Louise Stanley, Bill Cody Jr., and Fuzzy Knight have (just barely) survived an explosion in The Oregon Trail (Universal, 1939). Above: Fuzzy Knight and Johnny Mack relax for a bit of clowning in The Oregon Trail. 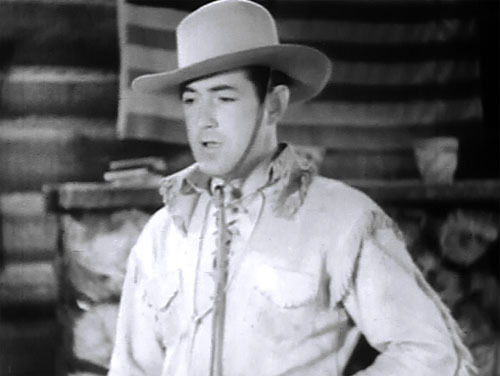 Brown’s quartet of Western serials had been uniformly successful for Universal, and the studio decided to move him up to Western features, beginning with Desperate Trails in 1939. After a four-year starring run in Universal’s B-westerns, Brown moved to Monogram Pictures in 1943, to begin another series of Westerns that featured his Rustlers of Red Dog co-star, Raymond Hatton, as his sidekick. Remaining at Monogram throughout the 1940s and into the early 1950s, he cemented his status as one of the screen’s most popular cowboy heroes, and despite some noticeable weight gain over the course of his career, continued starring in B-westerns till the genre began to die out. He retired to family life and a position as a Hollywood restaurant manager in 1952, but made a few TV guest appearances in the late 1950s and played some character roles in 1960s Westerns like Apache Uprising and The Bounty Killer. He passed away in Los Angeles in 1974. Above: Johnny Mack Brown defends the wagon train in Rustlers of Red Dog (Universal, 1935). Acknowledgements: The Old Corral’s page on John Mack Brown provided me with the biographical information in this piece.